Under sunny skies, the 2012 U.S. National Aerobatic Championship competition was held September 23-29 in Denison, Texas. Ninety-four pilots competed in all five power and four glider categories. The contest named U.S. national aerobatic category champions in four power and glider categories, a four-minute freestyle champion as well as the 2012-2013 U.S. Unlimited Aerobatic Team. CP Aviation, Inc. has awarded an Emergency Maneuver Training (EMT) scholarship to Adam Gillhom of Valley Village, CA. The flight school, based in Santa Paula, is known throughout the world for their specialized training curriculum, originally developed in 1987. 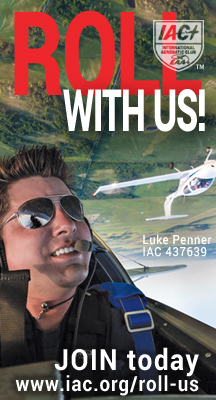 CP Aviation is the home of two Master CFI-Aerobatics, who have also been awarded National CFI of the Year by the FAA, Rich Stowell (2006), and Judy Phelps (2011). IAC wishes to congratulate the USA Advanced World Aerobaitc Team for their strong Bronze finish at the recently completed 10th FAI World Championships at Nyiregyhaza Airport, Hungary. Great Job Team, and thank you! You travelled far, overcame daunting obstacles, flew superbly, and represented your country and your IAC well. Have a great trip home! --Doug Sowder, President, IAC.